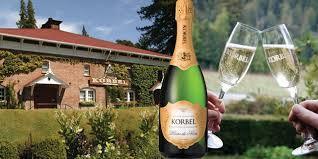 All KORBEL California champagnes are made according to the traditional méthode champenoise, in which the champagne is fermented inside the same bottle from which it is served. This time-honored process takes almost a year to complete, but the result is worth the wait. The taste of the méthode champenoise style is famous for its delicate nuances and for producing the countless dazzling bubbles in every glass of KORBEL California champagne.